Cost $20.00. Order by e-mailing RayCom Learning at [email protected] or call (740) 629-4536. 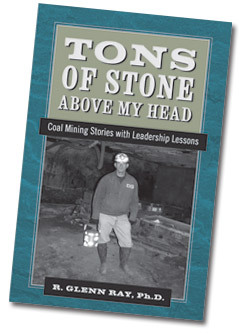 Tons of Stone Above My Head: Coal Mining Stories with Leadership Lessons was written for a variety of people. It is a story book for people who are interested in the culture of coal mining. Actually, the book was written for anybody who loves stories. In addition, the book offers helpful ideas for leaders and followers at all levels in organizations. Also, speakers and storytellers might find value in the variety of stories, which might trigger their own stories. Finally, this book could prove useful for those studying American coal mining culture in its heyday. This book is a first-person description of what nine years as an underground coal miner (four years as a member of the United Mine Workers of America and five years as a supervisor of production and construction crews) was like. With all the honesty and attention to detail I could muster, I explain the life or death physical and emotional challenges and the highs and lows of work relationships that was the culture of coal mining of the 1970s. As is my habit, I offer 100 leadership lessons resulting from stories throughout the book. "Ray tells a most compelling story about an old industry that clearly has lessons that can be used in this fast paced, highly technical and increasingly global world." "Ray masterfully combines experience and story with the wisdom of leadership." "Ray tells the story of coal mining in America as only a former miner can – boldly, honestly, and with critical insight." "This book will influence people at every level of an organization to implement leadership values and enhance teamwork to achieve success." Ray, R. G. (2010). Tons of Stone above my Head: Coal Mining Stories with Leadership Lessons. Little Hocking, OH: RayCom Learning.